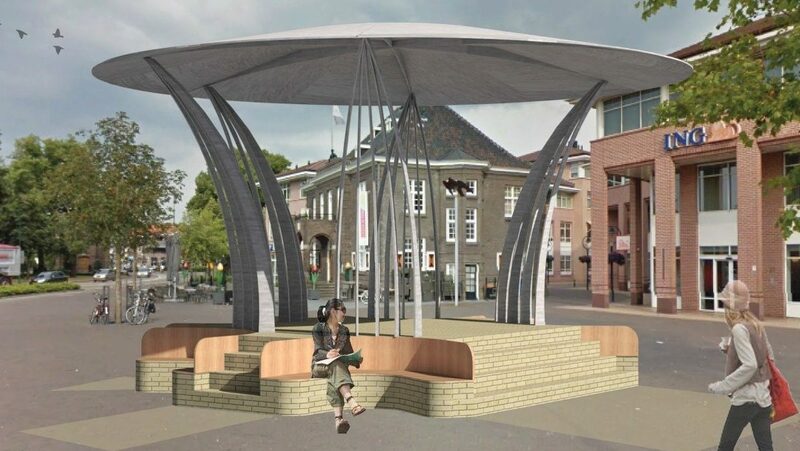 VALKENSWAARD – It has already been a year and a half since the citizens’ initiative Muziekkiosk Valkenswaard (BIMKV) submitted an application for the design of a music kiosk at the TU Eindhoven Science Shop. Four master students started working on this object with a historical background. There were previously three different music kiosks on the market and after years without any Citizens’ Initiative it was time for a successor. On 26 April last year, the students first got acquainted with the location, after which they started working under the supervision of Renato Kindt (Architect and lecturer TUe) and Wouter Margry (Architect). After eight weeks of hard work, all four students had a detailed design. Together with two other designs they were exhibited as 3D printed models in the town hall. A total of 340 people cast their vote, after which the design by Milan Geurts was declared the winner. Now it really seems to get from the ground: In collaboration with architect Wouter Margry the design is being further developed and the Citizens’ Initiative hopes that the music kiosk will get a place in the market at the end of 2020 in full glory.